One of the exciting opportunities I've taken this year has been to train as a SMART Practice Trainer through a programme auspices by the Department of Education and Child Development. Have you heard of SMART Practice before? SMART stands for Strategies for Managing Abuse Related Trauma. It's not a programme, or an extra thing to do. It's a way of thinking and acting. It's a way of creating environments and relationships that support our students who have experienced abused related trauma. PRACTICE is an acronym of the characteristics of relationships and behaviours that fit within the strategy. We spent the first day of the training looking at trauma and brain development, the second day at training techniques and the final day (quite some time later) reviewing our initial live training experiences and building further knowledge bases and training strategies. The main purpose of this course was to build a phalanx of SMART Champions who can deliver a 'taster' (of a longer course) to other teachers. It's a sound premise: getting those of us in the classroom talking to other teachers about some strategies they can use the very next day AND whetting their appetite for more in depth training. The reality for me, though, was so much more. Side note: Before I go any further I want to explain trauma. The trauma we're focussing on here is complex relational trauma. This trauma happens within relationships (often significant relationships), is often ongoing and carries a stigma of shame and isolation. This is distinct from so-called simple trauma such as a car accident, bushfire, death of a parent. It's a tough call to make because the research often shows that simple trauma will often bring to light or even cause complex relational trauma BUT in and of itself simple trauma tends to be more 'socially acceptable' and there are typically open support mechanisms around to help. I am NOT saying that simple trauma is SIMPLE. I think it's poor nomenclature but I'm working with what I've got so… I'm sorry. Trauma has a HUGE impact on the human brain. 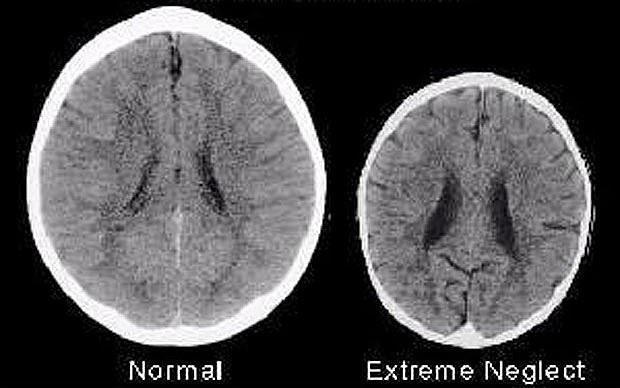 These brain scans are of three year old children. Already the difference is huge. cerebellum was developing and who now at 12 still has trouble with motor function: she's clumsy and struggles to hold a pencil to write. Or any child who has ever experienced trauma and can't remember where they put their homework because the door slamming shut was a trigger for their amygdala to switch on, their cortex to go offline and all access to episodic memory is immediately gone. Phew! The connections were vast and so easy to apply. Better than the intellectual lightbulbs that were pinging all over the place, was the message that there are simple strategies that through attuned and responsive relationships can be put in place to help these children. That there is HOPE. And that I, and many of my colleagues, already use these many of these strategies without realising it. Or explicitly realising the deeper impact of our actions. One of the other 'take home' messages for me was that time doesn't heal everything. As a society we hear it all the time… I, personally, have been told it many times in the last couple of months since Dad's passing: 'you'll get over it, time heals all'. Um no. Actually I won't. He's still dead. Time doesn't fix that. So why would we ever think that the passage of time will heal the injuries sustained by a child who has experienced trauma? What will help is processing and reintegrating the experiences. I know from this simple trauma I've recently experience that talking about it and making sense of it has helped me find peace. I still have moments - like hearing his voice on voicemail (how's that for a trigger!) - when it's hard to breathe but I'm explicitly learning strategies to deal with it. So we need to remember this for children whose trauma is complex and relational. Which brings me to my last point - for now, anyway - that we need to remember that the site of the injury MUST be the site of the healing. If the trauma happened in a relationship, it needs to be healed in a relationship. The relationships we build with all of our students help each and every one of them but especially those who have experienced trauma. As teachers we have a tremendous opportunity (and responsibility) to provide these children with a site to heal. We are NOT therapists, but we do get more time with these children than anyone else. Stay tuned for SMART Part II about how we went preparing for and delivering our first training session and what impacts I've seen in my classroom and the school.